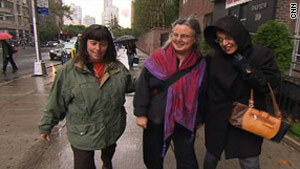 From left, Cindy Hickey, Nora Shourd and Laura Fattal have bonded in their mission to free their children. (CNN) -- The mothers of three American hikers detained in Iran have arrived in Tehran, Iran's Press TV reported Wednesday. Earlier, the hikers' attorney, Masoud Shafii, told CNN the mothers would be greeted at the airport by Swiss diplomats, including Livia Leu Agosti, the Swiss ambassador to Tehran. U.S. interests in Iran are represented by Swiss diplomats, since the United States has no diplomatic relations with Iran. The mothers were then to be taken to an undisclosed location, and they will meet their children Thursday, Shafii said. It was unclear whether the meeting would take place inside Tehran's Evin prison, where the hikers have been detained, or where the mothers are staying. "They may take them to where the mothers are," Shafii said. "The meeting could be one hour, four hours, or it could take the whole day. I hope it's the whole day so they can spend some time together." Sarah Shourd, 31; Shane Bauer, 27; and Josh Fattal, 27, were detained last July. Their families say the three accidentally strayed across an unmarked border into Iran while on a hiking trip in Iraqi Kurdistan. Shafii told CNN that Iranian officials have denied him access to his clients. He said he's held weekly conference calls with the mothers and plans to meet them on Friday. Fattal's mother, Laura Fattal, last week picked up visas that are enabling her and the two other mothers to enter Iran to visit their children. They had applied for visas six months ago. Asked whether she expects to meet with Iranian President Mahmoud Ahmadinejad, she said, "That's not in our hands."